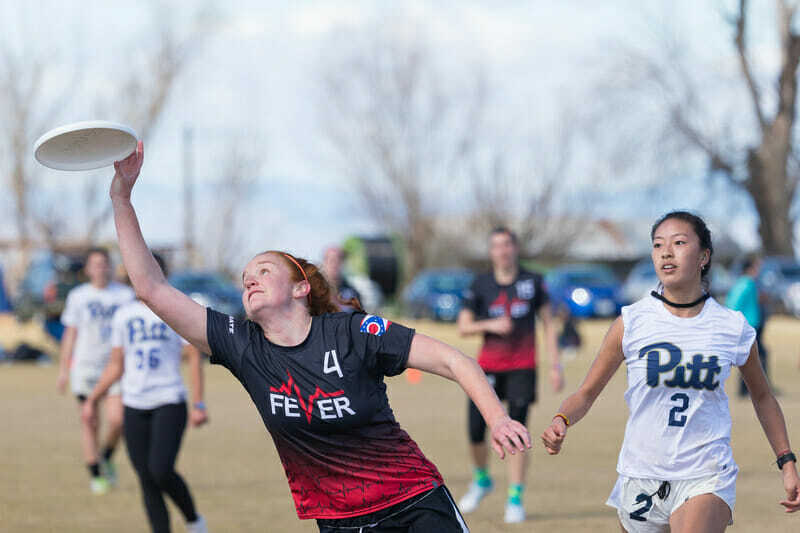 With nine Nationals qualifiers from 2018 and three of the top five teams in the most recent Power Rankings taking the field this weekend in a well-rounded tournament field, we will have an early look at the parity in the women’s college division this year. Will these potential Nationals semifinalists demonstrate their ability to dominate competition and distance themselves from the pack? Time will tell if the top-seeded teams can hold off the field, and how a few of these programs have adapted to a new season lacking their power players from last year. First-year additions are earning accolades and returning players have been building on their roles from previous seasons, preparing to step into larger roles with their respective programs. Queen City is an early season tournament, but one of the best women’s events on the East Coast all spring. As such, the effects of the cross-region competition will play into the bid picture, particularly for some of the smaller programs in the field who travel less and play fewer top teams. These bubble contenders could potentially play themselves into the bid discussion later this season if they can put up a good run of results this weekend against top teams from across the nation. After a surprise run to last year’s national semifinal, #9 Pittsburgh Danger has some work to do to prove themselves as the same powerhouse in 2019, now operating without Player of the Year and U24 star Carolyn Normile. Danger lost to tournament no. 2 seed UNC and no. 4 Ohio State this fall at the Blue Ridge Finale, but those results don’t mean anything in the context of this spring; if Pitt deliver a strong performance in Charlotte, they can silence any skeptics before their voices have a chance to really grow. Pittsburgh is still likely a favorite to represent the Ohio Valley at Nationals and this weekend should provide a clearer picture of their potential this spring, as they’ll have the opportunity to go head-to-head against a number of other National contenders. As the second and third seeds in Pool A, Florida FUEL and Clemson Tiger Lilies play with a similar style: both of these teams are eager to pull the trigger on deep shots, and they’re known for their gritty team culture. Both also will be on the hunt for rankings points, as they hope to secure their respective regions an extra Nationals bid. Florida look to build on a successful performance at Florida Winter Classic and improve the Southeast’s bid prospects. The region’s very slim shot at getting a strength bid depends on some big victories this weekend. Joining the team this season, Janina Freystaetter (formally of Central Florida) will take the field with FUEL and a core of returners that have certainly proven they can win the Southeast — they are, after all, two-time defending champs. After pushing Ohio State Fever to a two-point game at Florida Winter Classic, they have the look of a contender to push Southeast past just an autobid. With a strong game against Pittsburgh in pool play and a run in the bracket, they will have a crack at that this weekend. Clemson is fresh off a program-best postseason in 2018, and they return cutter Rachel Conway, who played a big part in that run last season. They’ve already compiled a 12-2 record across two tournaments this spring, almost exclusively against Southeast competition. They’ll look to stay hot and prove they belong among the contenders in the crowded Atlantic Coast region. #3 North Carolina Pleiades enters this tournament as a dangerous no. 2 seed. The one big question for UNC going into the 2019 season: how will the seven sisters balance returning leadership with young talent? This team returns an experienced and productive core from the 2018 season, adds a group of young stars, and gained club experience from top to bottom. This tournament will be our first look at the squad in the post-Jenny Wei era. UNC is unlikely to have any difficulty breezing through pool play if they stay true to their defensive systems through the potential winds; count on returners like Bridget Mizener, Anne Worth, and Rebecca Fagan to lead the offense. The real test for the Pleiades would come against the other Top 5 teams in attendance; with a strong performance, Pleiades would justify their high ranking and put UCSD and Dartmouth on notice. For the first time in program history, BYU CHI is leaving the West Coast to take a crack at the East’s top talent. Having also competed at Santa Barbara Invite last month, they’ll act as valuable connective tissue for early season rankings. They graduated big hitters Kaylie Caldwell and Jemi Ong, but they still have Quincey McKeen and Kendra Mitchell running their offense. CHI’s season got off to an inauspicious start at SBI, where they went 2-3 — with all three losses as blowouts. They’ll miss chances to play top teams since they won’t play in Sunday’s bracket, but their game against UNC could be one of the best games on Saturday. Watch out for UNC Wilmington Seaweed to challenge high-seeded teams as the underdog if they’re not taken seriously. This is a team with a penchant for upsets, but plagued by a lack of reserves or use of a team system. Hannah Boetcher and Kristen Reed will be on the receiving end of deep looks from Hannah Samuelson — early and often. Seaweed were competitive in losses to #2 Dartmouth, Georgia, and Florida at FWC, and took a win off of Georgia Tech, who is seeded above them in their QCTU pool. Georgia Tech Wreck has faced Seaweed already once this winter in fifth place bracket play at Florida Winter Classic, where they suffered a one point loss. Wreck’s resume from FWC was a tale of two teams. One team challenged Ohio State Fever to a narrow loss in pool play. The second took a six-point loss to Fever on Sunday and couldn’t quite put away a scrappy UNCW squad. Which version will cleat up this weekend in the rematch? With the past couple recruiting classes, #4 Carleton Syzygy has added enough talented pieces to challenge other top performers in the division this year. But many of those pieces are still young and inexperienced together, so it’s an open question if they will be able challenge UNC and Ohio State at this tournament. Signs point to yes, though it will be interesting to see how they exit the gate in pool play, whether at full gallop or merely a warm-up trot. Syzygy will use this weekend to demonstrate how far this team has progressed from last year’s early exit at Nationals. All eyes will be on Carleton to establish their ceiling, and this is our first chance to see what they’re made of. Michigan Flywheel will be entering the tournament fresh from a solid Winta Binta Vinta, where they lost in the final to Virginia. But after graduating key players like Brittany Wright, Amy Stoddard, and Grace Denney, Flywheel will have to rely on their systems this weekend instead of their stars. As one of the few squads this weekend who already has tournament experience under their belts in 2019, Michigan has a chance to work out some early season miscues in a sanctioned setting. Their rematch with Carleton, the team they knocked out of contention at Nationals last year, will be a potentially windy grudge match on Saturday. Michigan will face challenges from #17 NC State Jaga Monsta and #25 Georgia Athena as well. Jaga likely has a chip on their shoulder about being seeded behind a tournament field that they racked up wins against last season on their return to Nationals. Can the veterans they are returning upset a Flywheel team that they went 2-0 against in 2018, without the reigning Offensive Player of the Year? Carmen Tormey is returning to college competition following a strong season for Raleigh Phoenix and is likely to demonstrate her ability to dictate in downfield lanes. NC State’s run to Nationals began with a win over Tufts at this tournament last year, so they’ll be hoping to repeat that early season success. Pool D: Can Ohio State Repeat Their Florida Performance? Based on the final score of Florida Winter Classic, #5 Ohio State Fever is the real deal. How will they perform against other top ten teams at in Charlotte? At FWC, Fever was slow to get to full speed, but still ended the weekend with a near-defeat of two-time defending champs Dartmouth. With stars like Sadie Jezierski, Cara Sieber, and Emily Barrett dialed in, they could dominate during pool play and on Sunday. Big Sunday wins against Carleton or UNC would solidify Ohio State as a true contender for the a spot in the National championship game. With the losses of their leading scorers and main throwers from last season, #13 Tufts Ewo seem an unlikely candidate to take down Ohio State’s big stars. But Ewo has proven in the past that the loss of a previous season’s stars can spur the program forward. Their strength in developing new talent and a slow start from Fever could be a recipe for a pool play upset. While Margo Urheim will likely feature heavily, look for Tufts to lean on their depth to hold off teams with no answer to multiple players being major contributors. They will need to hold off Notre Dame Womb and their camo t-shirts during pool play as well. Womb has lost most of the roster who played in their 2015 Nationals appearance, and they tend to spend early season developing their new talent instead of trying to win bids. Virginia Hydra enters Queen City off a close win over Michigan at Winta Binta Vinta Fest, but this weekend will be their first competitive challenge against ranked opposition. Hydra spent last season rebuilding, and Queen City will be a key progress report on their development. Comments on "Queen City Tune Up 2019: Tournament Preview (Women’s)"